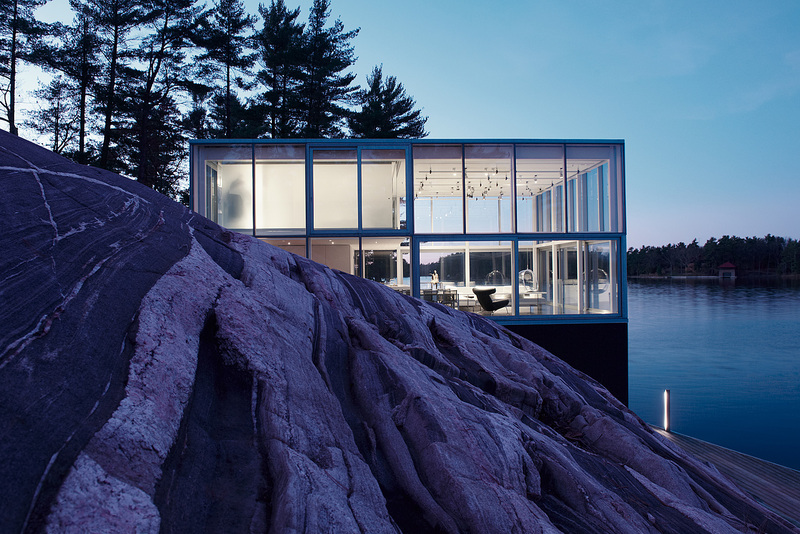 The compact glass form of the Photographer’s Studio on Stoney Lake sits on a granite plinth at the water’s edge; suspending the building, lantern-like, on the site. Continuously bathed in diffuse and undiminished natural light, the transparent façade of the north–facing live/work studio becomes the essential element in a photographic apparatus while transforming the site and surrounding vistas into a sublime, ever–changing backdrop. Conceived through a contemporary lens of sustainability, program, site and amenity, the innovative, context-driven design transforms the archetypal glass house to enhance the environmental and programmatic performance of the building, creating an architecture of pure iconic resonance. "Taking on the classical Canadian weekend boat house, this project refuses the stone and wood palette that 99% of its neighbours thrive on. 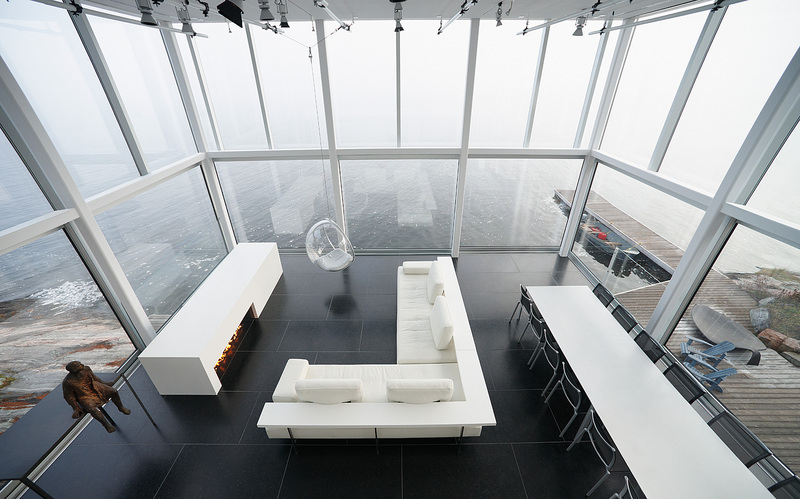 Transforming the modern glass house, the project instead takes the ephemerality of the mist, the snow, and the water as its interlocutor and uses a palette of “white” to underline qualities of the surrounding landscape. With technical virtuosity, the detailing of the studio is impeccable-- covering the depth of floor slabs, the relationship between glazing and railing, and the evidence of program, essentially “erasing” as much as possible to bring emphasis to the site itself." 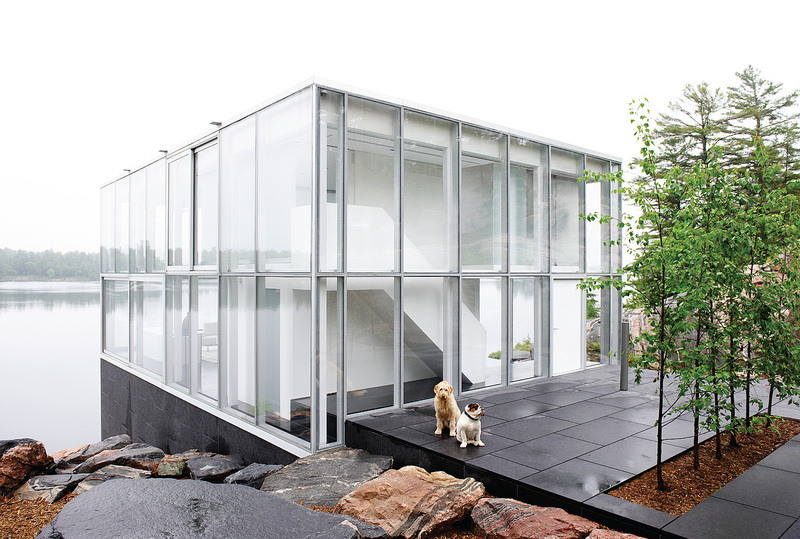 "The conceptual clarity of the reinterpretation of the glass house in an open landscape is pushed to the limit of construction technique. Slab, trusses dissolve and become invisible, hidden behind the mullions. The landscape becomes the background for this exercise in contained energy."